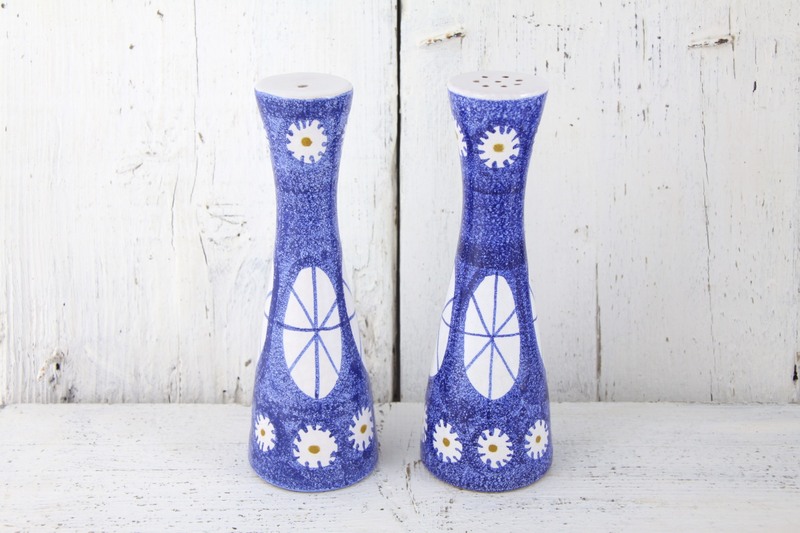 Bagni Ceramiche salt and pepper shakers, Italy circa early 1960’s. 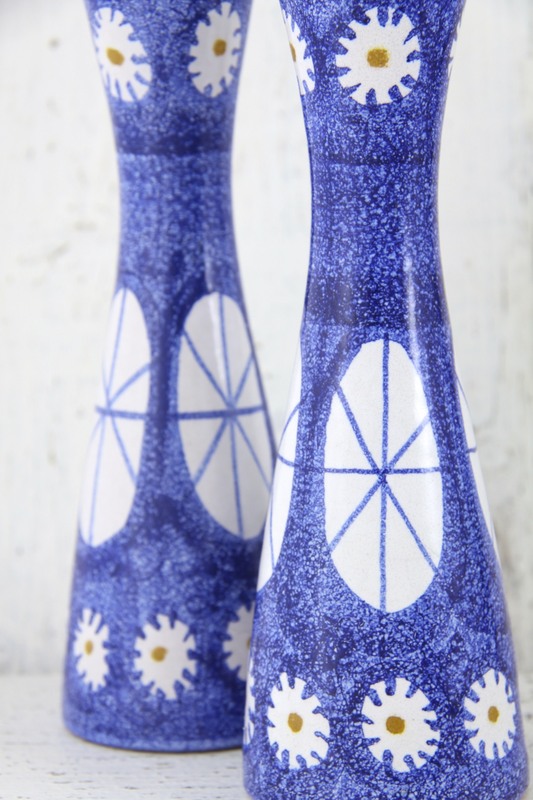 These are a Stunning Pair of Large Bagni Ceramiche salt and pepper shakers, made in Italy circa early 1960’s. This design, pattern no.42 was created by Alvino Bagni in 1959, the stippled blue glaze features bands of oval wheel and stylised flower / starburst motifs. Reflecting the popular molecular and atomic motifs of the 1950’s. A Wonderful tall hourglass form, very elegant and beautifully proportioned. The flat tops with their large holes for salt and pepper respectively complete the graphic look. This design can be seen on p.32 of Mark Hill’s ‘Alla Moda’ book. A Fantastic pair from one of the leading Italian ceramicists of the 20th century. Would look great in any 50’s, 60’s, retro, vintage, mid century modern, modernist, minimal or contemporary interior. A Great addition to any collection of Bagni / Raymor / Italian / European art pottery or 20th century design. In Excellent Condition, no marks, chips or scratches. Different stoppers in the bases of each but serve their purpose. Each measures 19 x 6.5 x 6.5cm / 7.5 x 2.5 x 2.5in. Hand marked to the base Italy 2840.